Delhi by its variety, congestion, and large expanse is a transportation challenge. Delhi, however, has an advantage in terms of good infrastructure in the form of wide roads and decent railway and air connectivity. Delhi roads are connected by Government-Owned Delhi Transport Corporation buses, and private buses, including chartered buses, White-line buses and Yellow-line buses.Road connectivity is mostly reliant on private vehicles. Delhi has the highest ratio of vehicles per capita in India. Delhi has one of India's largest bus connectivity rates. The State-Owned Delhi Transport Corporation and private operators with a permit from State Transport Authority ply buses across the city. The fares in buses are bases on the colour of the stripe on the bus. Regular DTC buses which are yellow in colour and have bus numbers in white plates. These buses have fares of denomination 2,5,7 and 10 rupees. Similar private buses are either yellow or blue in colour. Green-line buses have similar buses with yellow number plates and have GL printed ahead of the number. These buses charge a flat rate of 10 rupees. The auto rickshaw forms a very important economic means of private transportation. Hiring an Auto in Delhi is very tricky as not many auto-drivers accept the standard meter charges. The typical method is to negotiate and haggle for an agreeable rate. It is also typical for the rate to be almost doubled after 11 p.m. at night. With the introduction of electronic meters, the tamperability of meters has been reduced, and a stronger jurisdiction has forced more cars to comply with the meter-based charging scheme. Delhi was designed with a great deal of railway connectivity. There are many railway stations located with a great deal of connectivity with major parts of the city and the suburbs. 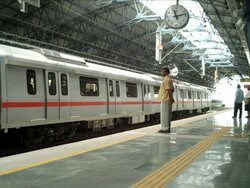 The major stations connected through the trains are Hazrat Nizamuddin, New Delhi, Okhla, Pragati Maidan, Purani Dilli, Shahdara, Shakur Basti and Tilak Bridge. One of the major local trains is the one that operates between Palwal station and Shakur Basti station. The city is served by Indira Gandhi International Airport. The airport is situated in the southwestern corner of the City.